Current backbench troubles reflect elected representatives who are divorced from the reality of life for most workers, writes John Passant. IT HAS BEEN quite a week for backbenchers. "... some of the things that Russia has gotten away with in the past [have] to be slightly looked over." Kelly is a Liberal and his comments could well see him lose pre-selection to Kent Johns, the man who has been circling him for some time. This is despite Prime Minister Malcolm Turnbull ostensibly giving Kelly his support — at least before Kelly made his MH17 gaffe. He compounded his error by then giving a conditional apology. Basically, he did a Trump and said his comments had been taken out of context, digging himself into a deeper hole. Kelly's comments were an example, yet again, of putting power before people. But that is what capitalism and imperialism do. His "realist" approach makes some sense, sort of. Yes, we all want a good relationship between Russia and the U.S., China and the U.S., Europe and the U.S. — most Australians don’t want war. And, certainly, most Australians don’t want to slavishly follow the U.S. into war. For our political leaders, it is a different story. The U.S. is an imperialist warmonger and we are one of its most faithful allies. Australia has ignored the crimes of the U.S. since 1945. Not only that, but as Vietnam and Iraq, for example, show, we have joined the U.S. in these crimes. It says much about Australian politics that we are rightly upset about Kelly’s comments while many Australians laud war criminal John Howard, who lied to us about weapons of mass destruction to lead us into a war that has killed over 2 million Iraqis. In New South Wales, State Liberal backbencher Daryl Maguire resigned from the Party but not the Parliament, after the NSW Independent Commission Against Corruption (ICAC) taped him negotiating a percentage cut if a multimillion-dollar sale of a property went through. What a surprise! The party of the false god of individual advancement and the market has elected members who see the way forward as being their own enrichment. It is classic trickle-down. What is good for the rich and their politicians is good for all of us and bugger the way they get there. It is time for a Federal ICAC. Wannabe Federal backbencher and former Coalition State backbencher Big Trev Ruthenberg claimed he had won an Australian Service Medal rather than an Australian Defence Medal. The former is for service in a non-war situation, such as peacekeeping. The latter is for having served for four years. Ruthenberg is fighting a by-election as the Coalition candidate in Longman, Queensland. He is running against, among others, Susan Lamb, the former Labor Party member for Longman, who had to resign because she was at the time of the 2016 election a dual citizen. 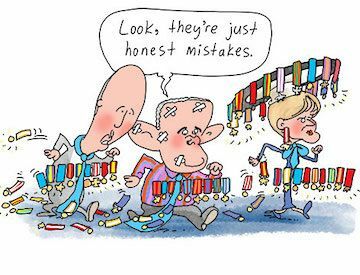 Until he misspoke about his medal, Ruthenberg was neck and neck with Lamb, especially given One Nation is preferencing him ahead of Lamb. After the Courier Mail exposed his ongoing medal misspeak, who knows? Well, according to the latest Reachtel poll – taken on Thursday, 19 July with 770 telephone respondents – the vast majority thought he had made an innocent or careless mistake. The poll suggests small minded Trev will win Longman. That poll has the Coalition ahead 51 to 49 per cent two-party preferred. It is too close to call in my view, given the three per cent (at least, with such a small survey size) margin of error. The fact that the outcome, a week out, is so close, irrespective of the outcome, should also raise questions about Shorten and his leadership. Why aren’t Labor a mile ahead? The closeness in the polls, if carried through in the vote on Saturday, should prompt real self-examination by the Parliamentary Labor Party, but probably won’t. Indeed, the direction being argued about appears to be to the right or further right. For example, the "left wing" and potential leader Antony Albanese is positioning himself on issues like refugees and cooperation with business to the right of current leader Bill Shorten — who is also on the right. The Parliamentary Labor Party allows a narrow range of debate between their two tribes and sub-tribes. (To call them factions is to mistake career paths for politics.) They agree overall on managing capitalism, they merely differ on the best way to do that. When, for example, was the last time you heard Shorten, Albanese or any of the other Parliamentary Labor Party members utter the word "socialism"? Given its historic links to the trade union bureaucracy, Labor sometimes makes concessions to that particular section of society — one whose existence depends fundamentally on the continuation of capitalism and their role of retailing the price of labour power. That is what the ACTU Change the Rules campaign is about. A Union-led campaign to elect a Labor government and, perhaps, give a few scraps from the table of capital won’t address the systemic problems, such as the growing levels of poverty, inequality, insecure work and falling wages. Where, for example, is Labor’s commitment to enshrine an unfettered right to strike 365 days a year in legislation? Without that, change the rules is trickle down for unionists. The symbiotic relationship between party and bureaucracy is a double-edged sword. It means the ALP can dictate overall policy to an eager bureaucracy tired of fighting the bosses. This is reciprocated by the collaboration of the bureaucracy. There are no better examples than when Hawke Labor deregistered the Builders’ Labourers’ Federation and used the Air Force against striking pilots. ACTU secretary Sally McManus and new President Michelle O’Neil have talked about fighting back, but appear to be limiting that to voting for Labor. Labor, too, has backbench troubles, with bullying complaints against MP Emma Husar. We need to be careful here because it is not clear if this is about bullying, misuse of taxpayer funds, or the ongoing oppression of women — or a combination of all three. As well as being an MP with all the demands this makes on her, Husar is a survivor of domestic violence and a single mother of three children. She seems to have asked her staff to do some personal and domestic activities. Show me an MP who doesn’t, given the demands on them. I’d hazard a guess that many male MPs ask their female staff to do various personal duties (make me a sandwich, tidy up the staff kitchen, drop off the dry cleaning, pick up the kids, take the dog for a walk) all the time. Let’s see what else comes out of this but if, as suggested, she has a staff member living with her who, according to Alice Workman in Buzzfeed, ‘performs household and nannying duties’, then there are real questions not only of her but of all MPs. Barnaby Joyce shows that any police investigation into misuse of funds is doomed because – apart from Peter Slipper – the investigators invariably accept the word of the MP. Investigative journalism anyone? The backbench troubles reflect much of what is wrong with Australian politics. We have elected representatives who are divorced from the reality of life for most workers, and for whom ignorance and self-enrichment abound and compete. The Liberal's Week so far..